If you’ve not yet staggered around Halifax taking in good beer at The Pump Room, The Grayston Unity, the Victorian Craft Beer Cafe and The Alexandra, it’s a civilised piss-up that I can heartily recommend. Trust me, I’ve put the hours in. While you’re there go for one at the Three Pigeons, too. Actually, make it a couple; I’ve got a soft spot for the old place. It was on one of these cultural jaunts, or ‘sessions’ to the uncouth, that we decided to have another squiz around the fairly-recently reopened Piece Hall. I doubt you’re here to listen to me waffling on about architecture and the like (I couldn’t if I tried) so have a look at the website and see for yourself. Impressive, eh? You’ll find Elder down there in the corner. Big windows. Nice spot from which to watch the world go by like they do in those fancy cities. A chef/owner with form from his Friends of Ham days. So how come, as a relative local, this is my maiden visit? It’s a simple case of FOMSP: Fear Of More Sharing Plates. For Sharing Plates is Elder’s evening thing, and despite enjoying some of my favourite meals at gaffs doing the small plate stuff – The Swine That Dines in Leeds, Oktopus in Liverpool – I can’t be the only one who feels a sense of unease when faced with such a menu. “Is it like tapas?”, a lady on a nearby table asks, all tentative. “We don’t like to use the T word here,” is the sardonic reply. See, sharing sounds civilised but it’s an approach that involves compromise, and compromise invites uncertainty, and uncertainty is the enemy of appetite. We worry about divvying up. We get sweaty palmed at the thought of idiots ordering the lentil salad and then nicking our chips. Or maybe it’s just me. Either way, panic not. Elder’s well-choreographed chefs – the duo waltzing around the compact open kitchen with poise and purpose on this visit – will feed you well. 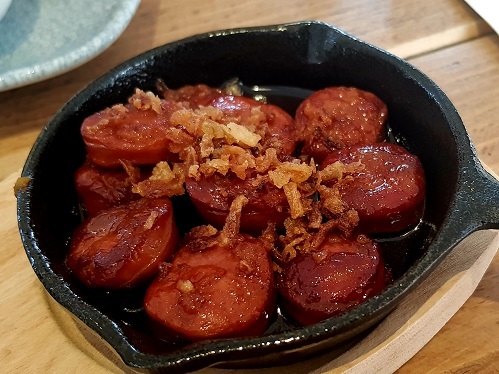 We get amongst crowd-pleasing chorizo, soft within and crozzled without; its rusty oil – zingy with cider – mopped up with good stretchy bread. 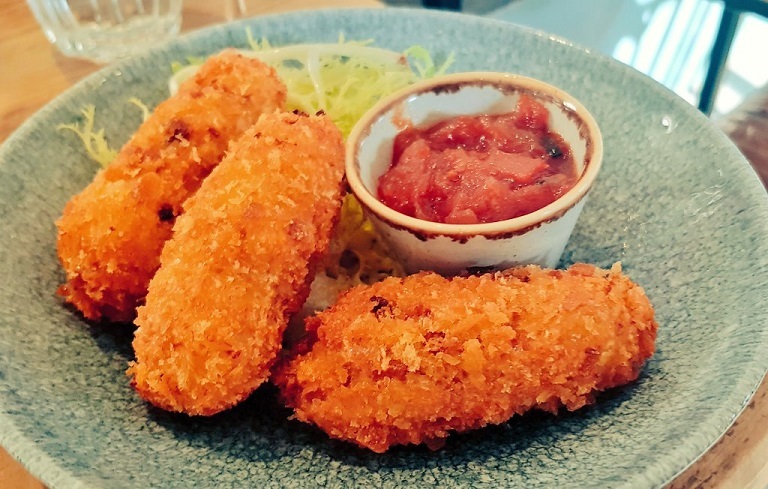 Then there’s smoked haddock fishcakes which, executed lazily, could be an afterthought for leftovers but here are mini torpedoes of spud dotted with spring onion and fish in an enticingly crisp casing, fried until just right. 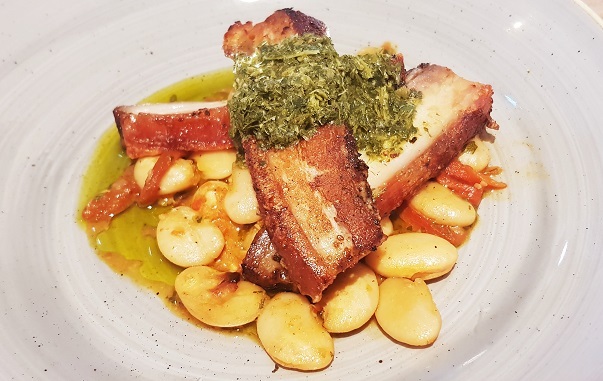 We have a break and then go back in – the lesson of ordering in stages to thwart peaking too soon learnt long ago – now copping discs of crispy lamb breast, its fat pearly and buttery. You’ll want to ditch the forks and utilise the fingers for this one. It comes with blackened lettuce which never sounds appealing but always is, its smokiness double-underlining the dish’s meatiness. Chunky strips of pork belly, another cut that needs plenty of TLC to be at its best, are belting. The flesh slow-cooked to yielding, the glistening fat somewhere between charred and chewy. A herby green sauce adds vibrance and creamy beans a luxurious heft. We order potatoes draped in a melting cheddar because we’re not stupid, and a salad because we are. Both are simple little numbers assembled with good ingredients and care. Indeed, every dish we scoff at Elder is precise without being poncey; each element doing its thing and nothing there just for show. A ‘bite’, a ‘plate’ and a side will come in at under 20 quid in old-money a la carte. Corking value for such tidy cooking. 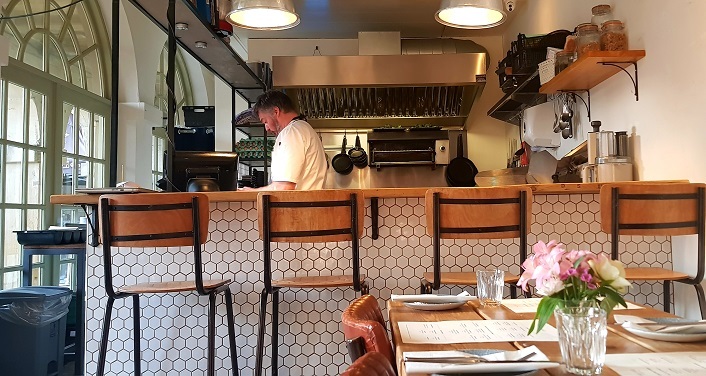 It’s a menu that changes regularly – I hear whispers of beef brisket and confit duck – and one that I look forward to exploring again, even if it does mean sharing.